This Letter to the Editor will appear in Alpinist 57—spring 2017, available on newsstands in a few weeks. IN AN EFFORT to understand a new and unsettling era, in which much that was considered just and sensible now appears cast aside, I find myself looking to lessons found in climbing and its history. It is not the first time that I have sought refuge in what is most familiar to me or have felt that life's confounding challenges can sometimes be analogous to mountain experiences. So, here I am, picturing our nation—and indeed the world—vulnerable to forces that are chillingly similar, though greater and more capricious in their devastating potential, to those faced by ill-fated climbers on the Eiger Nordwand. Consider, for example, a rope of determined alpinists, who are more than a climbing team, forging a new line up the notoriously grim face. Imagine, in this case their striving represents our country's efforts to mitigate the worst effects of the environmental crisis. The route to the top is uncharted. There are cul-de-sacs and pitfalls to be overcome. But with skill and careful preparation, a way through can be found. Now, however, the climbers confront the increased threat of the moral faltering of a nation, and a danger like no other threatens to sweep them from the mountain. As we enter what may be one of the darkest times of our country's history, I feel an obligation to subject my most basic values to the utmost scrutiny. These values guide many personal decisions that in turn are based on an assessment of risk that I must not limit to myself. And the best measure of risk to apply to our shared future can be found in the irrefutable reality of climbing. It is perilous to ignore the degree of danger I accept in the mountains. A careful weighing of potential outcomes is vital to both personal and group survival. Once a decision is reached, all objective dangers of the chosen peak come with it, not just the ones I feel most comfortable with. That choice defines who I am, and I own all of it. I must never put my rope mates in harm's way because I expect the mountain to become benign—when history proves otherwise—simply because I think it will. Off the hill, I am roped to more than a close friend or two. A rope of seemingly infinite length connects me to strangers of all ethnicities, languages, and beliefs—and to generations yet unborn. 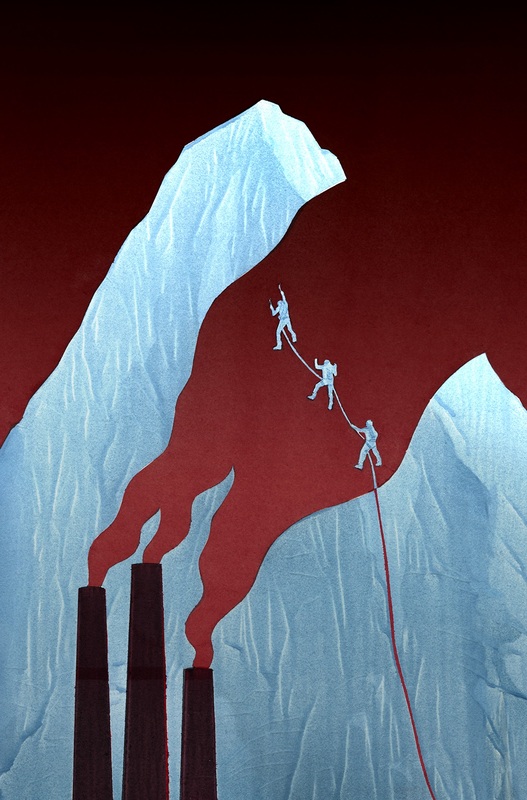 For better or for worse, climbing and politics are also inextricably joined. The continuation of outdoor pursuits depends on advocacy to safeguard access. The health of wild regions requires efforts to limit industrial development and resource extraction, and more. The destructiveness of climate change, an abstract idea for some, becomes very real through intimate contact with the natural world. My climbing experiences do not permit me to believe that serious human-made warming is not happening at an unprecedented rate. Even the age-old desire to place financial interests above all else can no longer be argued as a pragmatic choice. Environmental stability is, clearly, a foundation of economic well-being. I sometimes think that I must write a letter to be opened in the future when my children have reached my age, the contents of which contain the justification for my beliefs and actions in this time when so much, especially the basic right to a healthy planet, hangs in the balance. I hope they will see that I was on their side. Every American will have a role to play in our unfolding Eiger drama. Crowds will fill the viewing area of Kleine Scheidegg. Some may feel vindicated when rockfall and avalanche descend. Others will be sickened by the onslaught and retire, understandably, to the bar. And what will our community do in defense of the climbers when their survival becomes imperative? I wish to believe that the greatest number of us will be above. There, fortified with a cup of the sector guard's warming tea, we leave the dark and narrow confines of the railway tunnel and step past the gallery window, knowing that our rescue must succeed.